We revitalized the image of Yahoo! E-mail system that was losing market share. 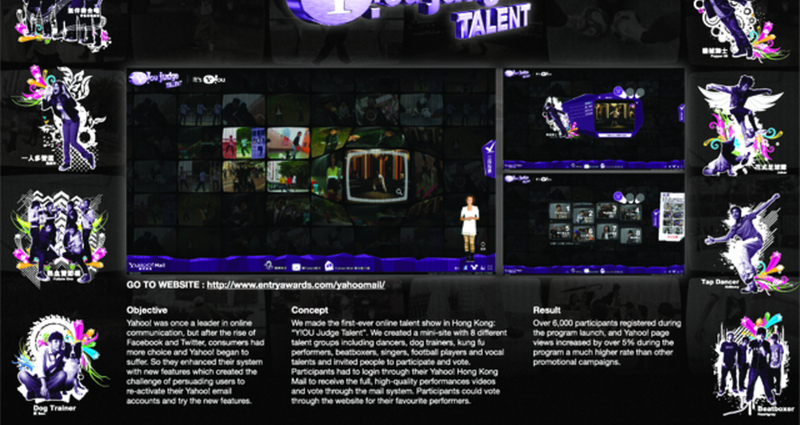 We created the first-ever online talent show in Hong Kong: “Y!OU Judge Talent”. We created a mini-site with 8 different talent groups including dancers, dog trainers, kung fu performers, beatboxers, singers, football players and vocal talent and invited people to participate and vote. Participants had to login through their Yahoo! Hong Kong Mail to receive the full, high-quality performances videos and vote through the mail system. Participants could vote through the website for their favourite performers. Yahoo! had a well-established network and good market penetration in Hong Kong. But although registration numbers were high, activation was low. To re-engage their user base and attract new users, Yahoo enhanced their system with new features including unlimited mail storage and faster speeds. Our objective was to persuade users to try the new service. The greatest challenge was recruiting the performers. We wanted to recruit enough performers in each group to give the campaign scale so we had to put a lot of effort into advertising. In the end over 6,000 participants registered during the program launch, and Yahoo! page views increased by over 5% - a much higher rate than with other promotional campaigns.